Dhaka, Dec 21 (Just News): BNP on Thursday alleged that the Rangpur City Corporation election was not fair, neutral and peaceful due to the 'subservient' Election Commission's failure. The party also said the voter turnout was unprecedentedly very low as the ruling party men spread panic among the supports of BNP mayoral candidate. "The cadres of Awami League and the grand alliance with the help of partisan administration forced out BNP mayoral candidate Kausar Zaman Babla's polling agents from different centers was barred from visiting many polling stations," said BNP senior joint secretary general Ruhul Kabir Rizvi. Speaking at a press conference on the polls at its Nayapaltan central office, he also said, "There're two ways to rig votes--resorting to terrorism and election engineering. The two ways were applied in the Rangpur City Corporation polls." Rizvi said journalists were also obstructed by the administration from visiting some polling stations as they were engaged in election engineering. He alleged that different centers, including Fatehpur School, Deudoba and Kellabandh, were captured to rig votes. The BNP leader alleged that a question has arisen in public mind whether the government has taken all the measures to ensure the victory of the candidate of their choice by rigging votes amid the thin presence of voters. Outgoing mayor Sarfuddin Ahmed is contesting the election to retain his mayoral position with Awami League ticket while Kausar Zaman Babla and Mostafizur Rahman Mostaf with BNP and Jatiya Party tickets respectively. 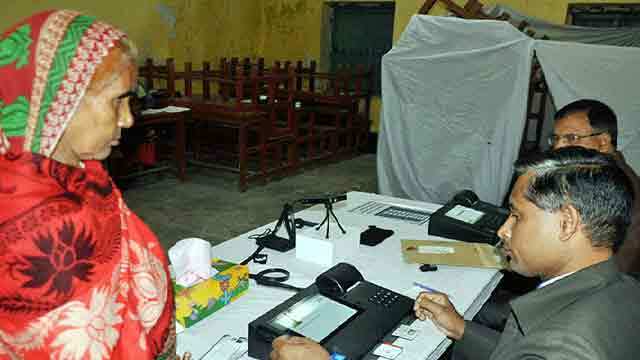 The voting at 193 polling stations of the Rangpur City Corporation began at 8pm and continued until 4pm without any break. Rizvi described the mayoral candidates of Awami League and Jatiya Party as two branches of the same tree. He alleged that the government is working to ensure the victory of one of the two candidates of Awami League and Jatiya Party as per their blueprint. "The Chief Election Commissioner and the local administration are helping it implement the blueprint."